MoreMs. Abona joined Conklin Benham, P.C. as an associate attorney in October of 2018. She specializes in workers’ compensation defense and negligence law.During law school, she interned at the Legal Aid and Defender Association and the International Institute of Metropolitan Detroit.Following law school and admittance to the State Bar of Michigan in 2012, she also became admitted to the Illinois Bar in 2013. 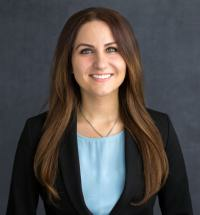 Prior to joining Conklin Benham, P.C., she handled matters dealing with mortgage...Ms. Abona joined Conklin Benham, P.C. as an associate attorney in October of 2018. She specializes in workers’ compensation defense and negligence law.